Here's a fun experiment I tried when trying to clean up leftovers in my fridge. It's hard to go wrong with stuffing bell peppers. Almost anything blends with it such as rice, beef or in this case, ground turkey with a little bit of cooked quinoa. Sorry ahead of time for not jotting down exact measurements. This recipe is something I just put together as I went along. But it should give you an idea on how to come up with your own ingredients and measures. Cut off the top of a bell pepper and clean out the inside. Sauté ground turkey, minced shallots and minced garlic. Season lightly with salt and freshly ground pepper. When the turkey mix is done cooking, transfer it to a small bowl, add a couple spoonfuls of cooked quinoa. Add Sriracha to taste and mix well. Stuff the turkey mix into the bell peppers and bake for 25 minutes. Take out the bell pepper, sprinkle mozzarella over the top, and return to the oven for another 5 minutes to melt the cheese. Just some notes, if you don't have quinoa, use rice or potatoes cut up in little squares as a substitute. The Sriracha gives this recipe a little kick. Perhaps use ketchup instead if you don't want hot and spicy. 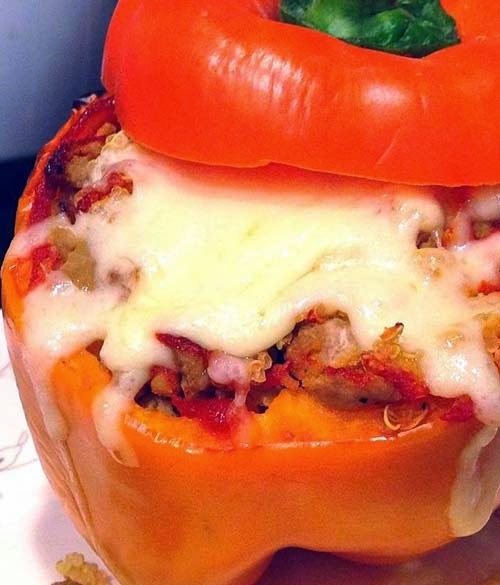 See here for another stuffed bell pepper recipe.